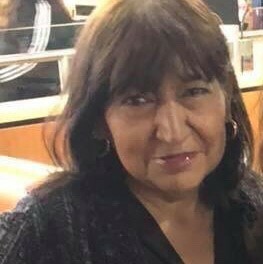 Evangelina Villarreal Arredondo, age 63, passed away on March 26, 2019.
moved to Corpus Christi, Texas and married the love of her life, Juan Luis Arredondo. Eva pursued an Early Childhood Education Degree and worked for Nueces County Community Action Agency as a Teacher and then a Family Advocate. nature. She was a cherished wife, mother, sister, grandmother and friend. Eva is preceded in death by her Husband, Juan Luis Arredondo, Mother and Father: Pedro and Ofelia Villarreal; her brother, Rene Villarreal; son in law: David Salazar Jr.
Villarreal (Rosemary), and numerous nieces and nephews. A Memorial Mass will be held at 11:00 a.m. on Saturday, April 6, 2019 at St. Mary’s Catholic Church located at 1500 Duval Ave., Freer, Texas 78357. A Blessing will be held at the Pierditas Cemetery immediately following mass and then proceed to the Family’s Ranch in Freer for a celebration of her life.